Congratulations to DIRTT (Doing it Right This Time) Environmental Solutions, who was awarded the 2018 World Trade Center Savannah International Business of the Year Award at the Annual Chamber Business Awards Banquet on Thursday, Sept. 13! Founded and headquartered in Canada, DIRTT is a building process powered by technology that creates customizable, sustainable architectural interiors. They are revolutionizing the construction world with industry-leading software and advanced manufacturing. Complete interior spaces are built faster, cleaner and more sustainable. DIRTT located a manufacturing facility in Savannah in 2009 and employs more than 150 people, known as DIRTTbags, in Savannah. They have been a WTCSav partner since 2016. 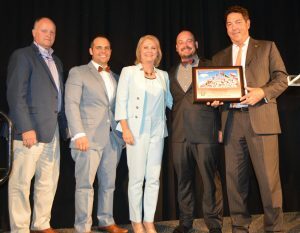 The World Trade Center International Business of the Year Award recognizes companies that excel in international trade and acknowledges the importance of trade to the Savannah region’s economy. DIRTT exemplifies this award as a manufacturing facility that not only supports customers throughout North America but their products are also exported from Savannah to Europe and the Middle East.